We are excited to have a special guest post from Friend of the Blog (F.O.B) Jim Corbley, a Tenleytown native, who recounts the only time a sitting U.S. President came under enemy fire. It happened here in Washington at Fort Stevens during the Civil War. July 11, 1864 - Confederate forces under General Jubal Early advanced upon Washington, DC, (from the NORTH!) 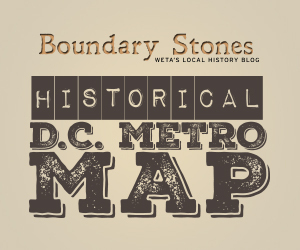 actually entering the outskirts of the city on both sides of the valley formed by the Rock Creek, getting as far as Fort Reno, which guarded the Rockville Pike approach (now Wisconsin Avenue) on the west side, and Fort Stevens, which guarded the Piney Branch Road approach on the east side. The city was in a state of mild panic. Ulysses S. Grant had ignored President Lincoln's concerns about defending the capital in order to repeatedly hurl as many able-bodied men as he could at Robert E. Lee in battle after battle in the inexorable Overland Campaign. Thus despite having an abundance of defenses surrounding the capital, those defenses were not abundantly manned. As Confederate skirmishers advanced from the farms of nearby Kensington, the Fort Reno garrison was hastily bolstered with wounded soldiers from the nearby veterans' hospital and a bunch of very nervous civilian government workers from down town. But one thing Fort Reno did have was an array of Parrott rifles - cannons - with at least one capable of firing a shot more than three miles. And it had the advantage of altitude. Fort Reno is the highest geographic point in the city. The battle lasted two days, most of it swirling around Fort Stevens, as the Parrott rifles at Fort Reno apparently were considered more of a threat. Casualties on both sides are estimated to have totalled about 600, with the number of Confederate casualties outnumbering those of the Union defenders by a factor of 10 - 1. The battle does not have the notoriety that Gettysburg has, or Antietam, or Chancellorsville, or even nearby First and Second Manassas, but perhaps it should have at least a little more. While less an attempt to capture the capital, and more an attempt to draw troops away from Grant's forces harassing Richmond, it is also legendarily considered to be the only time in US history that a sitting president came under enemy fire. President Lincoln was personally reviewing the defenses at Fort Stevens as the Confederates closed on the little fort, with future Chief Justice Oliver Wendell Holmes, then the President's aide-de-camp, reportedly shouting at Lincoln to "Get down, you fool!" Had Lincoln been killed or captured, little more than 100 days before the upcoming election, who knows how American history would have turned out? To learn more about this unique incident and other local stories, Jim recommends picking up a copy of Tenleytown: From Country Village to City Neighborhood by Judith Beck Helm. Also, tune in to WETA TV 26 on September 7 as PBS stations nationwide re-broadcast Ken Burns's landmark documentary series, The Civil War, fully remastered for the first time High Definition. Did you know that Walt Whitman spent a very formative period of his life in Washington during and after the Civil War? You've seen Mercy Street, but what was the real life Civil War experience like for Union Army doctors? Read a Wisconsin surgeon's diary.